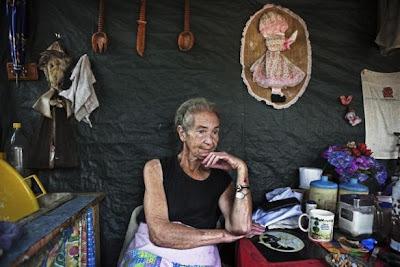 A woman looks out the window of her one-room hut at a squatter camp for poor white South Africans at Coronation Park in Krugersdorp. 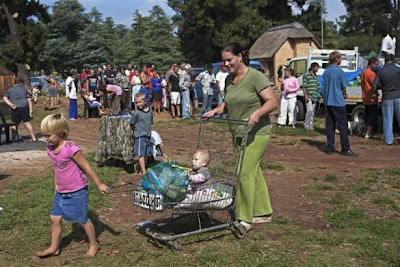 A shift in racial hiring practices and the recent global economic crisis means many white South Africans have fallen on hard times. Researchers now estimate some 450,000 whites, of a total white population of 4.5 million, live below the poverty line and 100,000 are struggling just to survive in places such Coronation Park, a former caravan camp currently home to more than 400 white squatters. Friends talk through the window of a one-room hut at a squatter camp for poor white South Africans at Coronation Park in Krugersdorp. 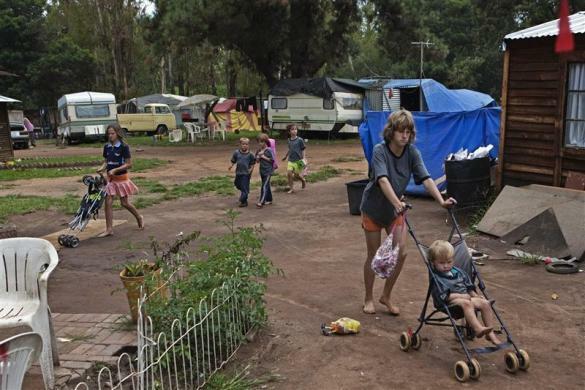 Children walk through a squatter camp for poor white South Africans at Coronation Park in Krugersdorp. 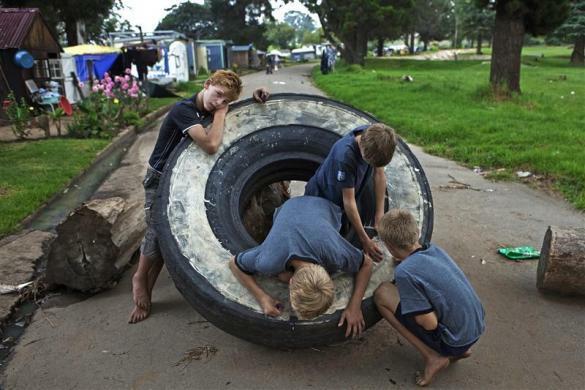 Children play with a tyre used to block the entrance to a squatter camp for poor white South Africans, at Coronation Park in Krugersdorp. A family smokes together during a quiet moment at a squatter camp for poor white South Africans at Coronation Park in Krugersdorp. 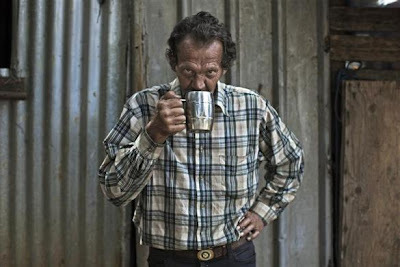 Andre Coetzee, 57, drinks a mug of coffee at a squatter camp for poor white South Africans at Coronation Park in Krugersdorp. 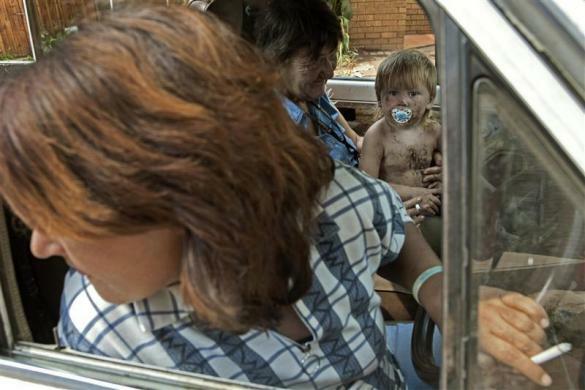 A woman drives a car at a squatter camp for poor white South Africans at Coronation Park in Krugersdorp. A man receives a monthly supply of food aid donated to residents of a squatter camp for poor white South Africans at Coronation Park in Krugersdorp. 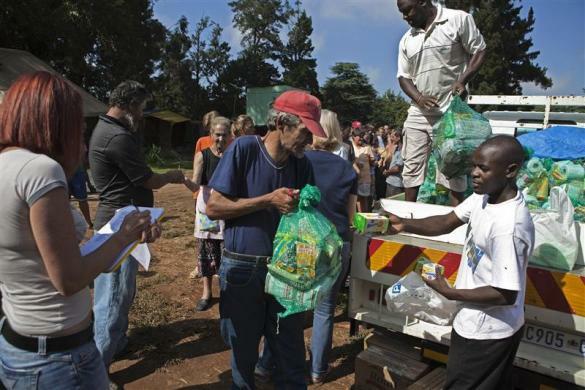 A woman pushes a cart with a monthly supply of food aid donated to residents of a squatter camp for poor white South Africans at Coronation Park in Krugersdorp. 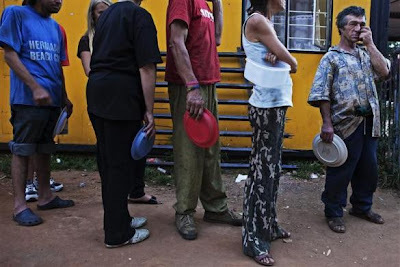 Residents of a squatter camp for poor white South Africans line up for a communal meal at Coronation Park in Krugersdorp. 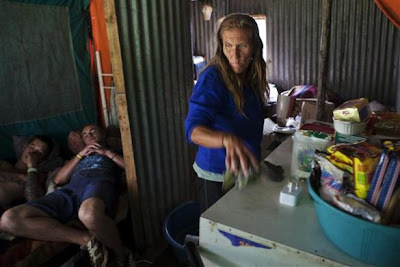 Leone Smit, 41, does dishes in her shack while her son and his friend rest on a bed at a squatter camp for poor white South Africans at Coronation Park in Krugersdorp. Andre Coetzee, 57, (L) sits with a neighbouring family at a squatter camp for poor white South Africans at Coronation Park in Krugersdorp. Mara Udwesthuizen, 64, sits outside her tent home at a squatter camp for poor white South Africans at Coronation Park in Krugersdorp. 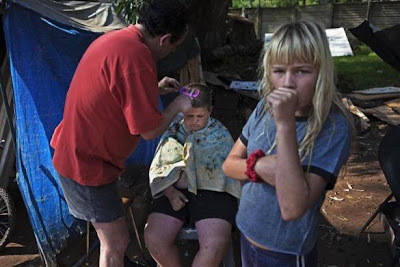 Vernon Nel, (L) cuts the hair of Reynard, 14, at a squatter camp for poor white South Africans at Coronation Park in Krugersdorp. 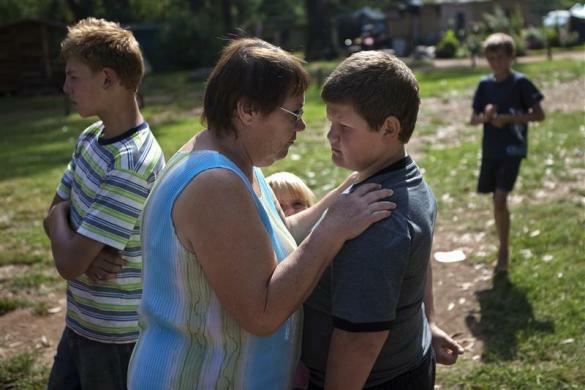 Anne Le Roux, 60, calms down her grandson, Reynard, 14 at a squatter camp for poor white South Africans at Coronation Park in Krugersdorp. Lukas Gouws (C), 29, scolds a boy for digging up snakes at a squatter camp for poor white South Africans at Coronation Park in Krugersdorp. 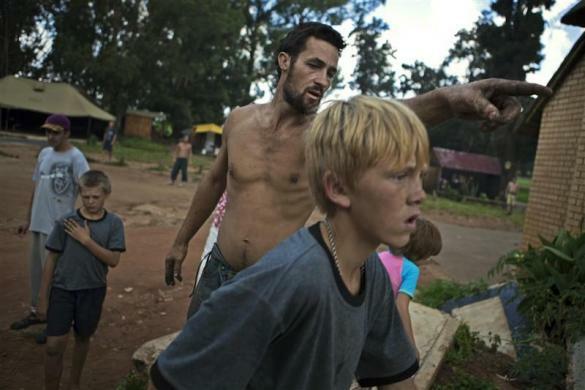 Lukas Gouws, 29, smokes at a squatter camp for poor white South Africans at Coronation Park in Krugersdorp. 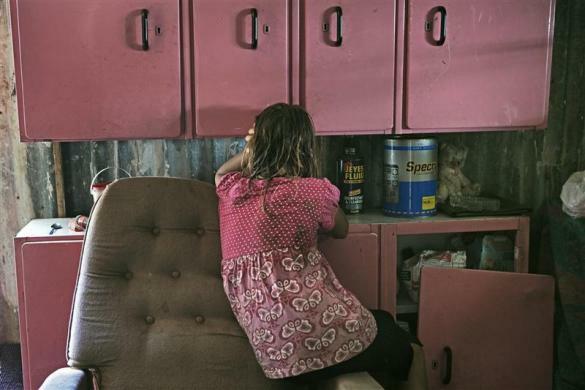 A girl cries after being beaten by her father, in their makeshift home at a squatter camp for poor white South Africans at Coronation Park in Krugersdorp. A teenager plays cricket at a squatter camp for poor white South Africans at Coronation Park in Krugersdorp. 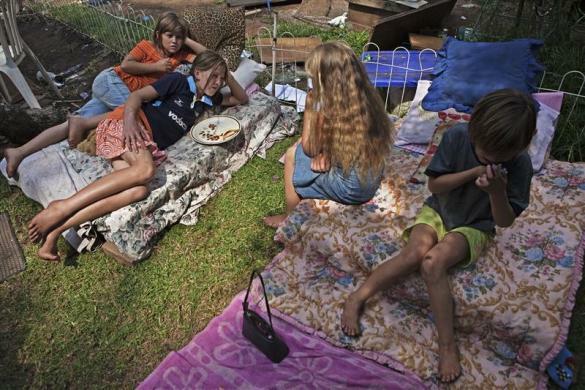 Girls set up a play house in their garden outside a family shack at a squatter camp for poor white South Africans at Coronation Park in Krugersdorp. 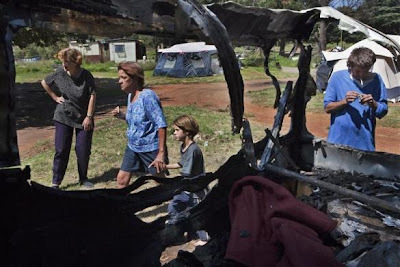 Donovan Durant, 23, (C) weeps as he looks at blood-soaked rags burning in a fire after his girlfriend gave birth prematurely and their baby died after a few hours at a squatter camp for poor white South Africans at Coronation Park in Krugersdor. 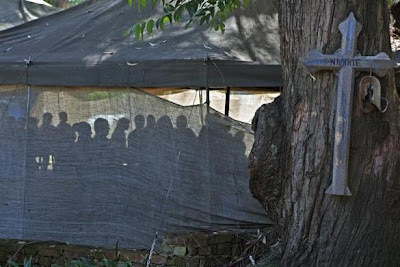 People attend an Afrikaans Sunday service in a makeshift tent church at a squatter camp for poor white South Africans at Coronation Park in Krugersdorp. Anna Snyders (C), 20, grieves beside her boyfriend, Donovan Durant, 23, at the funeral for their baby who died hours after she gave birth prematurely at a squatter camp for poor white South Africans at Coronation Park in Krugersdorp. 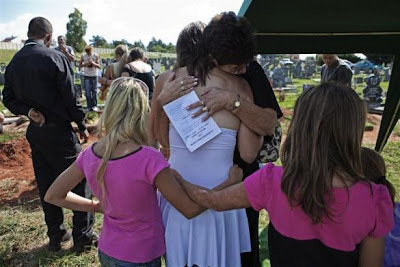 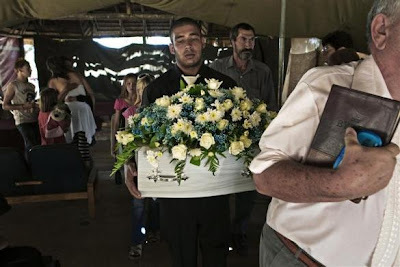 Anna Snyders, 20, (C) is comforted during the funeral for her baby who died hours after being born prematurely at a squatter camp for poor white South Africans, in Krugersdorp. Donovan Durant (C), 23, carries the casket of his baby who died hours after being born prematurely while his girlfriend Anna Snyders, 20, (L) is comforted during a funeral service at a squatter camp for poor white South Africans at Coronation Park in Krugersdorp. Desmond Thomas, 40, (R) lights a cigarette beside the charred remains of his caravan that burned down the previous night after a candle set it on fire at a squatter camp for poor white South Africans at Coronation Park in Krugersdorp. 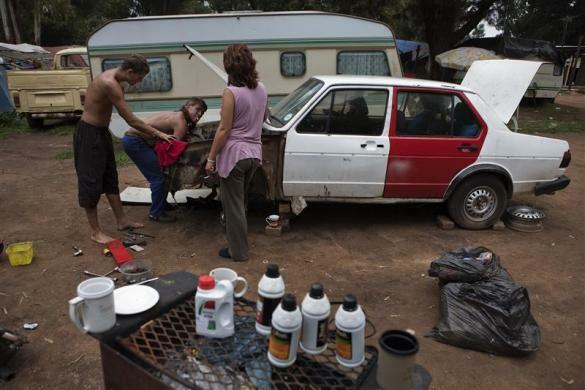 Residents work on reparing a car at a squatter camp for poor white South Africans at Coronation Park in Krugersdorp. 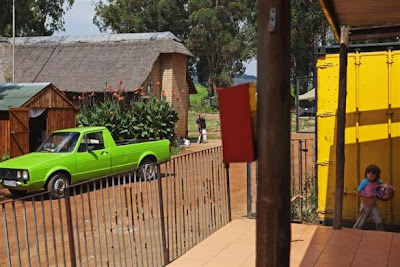 A resident works on reparing a car at a squatter camp for poor white South Africans at Coronation Park in Krugersdorp. 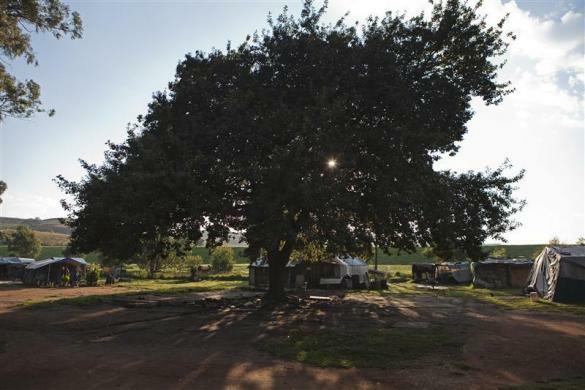 Rudolph, 12, does his homework in the kitchen of his family's shack at a squatter camp for poor white South Africans at Coronation Park in Krugersdorp. Accountant Vernon Nel checks his email on generator-powered computers using a wireless modem in a tented home attached to caravan that he shares with six other people at a squatter camp for poor white South Africans at Coronation Park in Krugersdorp. 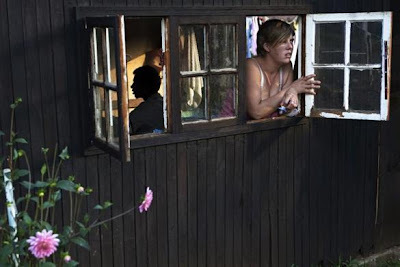 Vincent Abbott, 42, enjoys an evening smoke as his wife Esther Botha, 41, knits on their bed inside their small single-room hut at a squatter camp for poor white South Africans at Coronation Park in Krugersdorp. 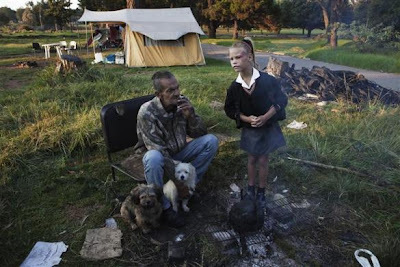 A girl stops by a neighbour's fireplace before she walks to school from a squatter camp for poor white South Africans at Coronation Park in Krugersdorp. 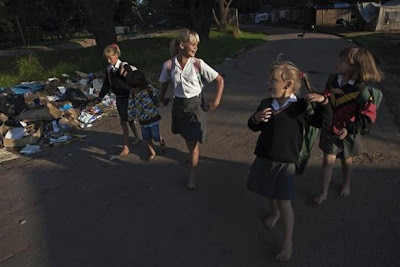 A girl puts her hair in a pony tail as she gets ready to walk to school from a squatter camp for poor white South Africans at Coronation Park in Krugersdorp. Girls walk to school barefoot from a squatter camp for poor white South Africans at Coronation Park in Krugersdorp. 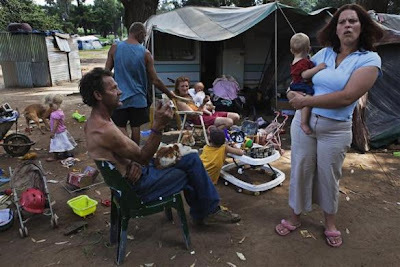 The sun rises over a squatter camp for poor white South Africans at Coronation Park in Krugersdorp.